A multi-talented musician whose repertoire includes vocalist, songwriter, performer, arranger, band leader, guitarist and producer, Marcus Yabba Griffiths was born in Manchester Parish, Jamaica. At age eleven, he moved to the capitol city; Kingston, Jamaica, reggae capitol of the world. A member of the vocal group, Gold Tones, Yabba Griffiths recorded a single entitled ‘Girl Exposer’ for Duke Reid’s Treasure Isle Label, and caught the attention of Rendford Cogle, who was the main songwriter for the Melodians. Mr. Cogle wrote ‘Lock Love Away’ for Yabba Griffiths to sing on Sonia Pottinger’s Hi-Note label and, in 1969, the song soared to #8 on the Top Ten Charts in Jamaica. As a studio musician guitar player, Yabba Griffiths worked with many of the greatest musicians and singers of Jamaica including Bunny Wailer, Soul Syndicate, Gregory Isaacs, Roots Radics, Carlton and Family Man Barrett, Winston Wright, Lynn Taitt, Jackie Mittoo, Robbie Shakespeare, Sly Dunbar, The Tamlins, and Bobby Colphat, among many others. Yabba Griffiths and Traxx released their first album, ‘Thrill of Victory,’ in 1986 on the New York based Gysai Label. ‘Thrill of Victory’ was named “One of the best new albums of the year” in Europe. During the summer of 1989, Yabba Griffiths met producer Greg Errico, a founding member of Sly & The Family Stone, and based on his favorable impression of the artist, Mr. Errico produced Yabba and Traxx’s second album, ‘Reviver,’ recorded in Sausalito, California. Yabba Griffiths’ third album, ‘Only Yabba,’ was released in 1998 on Myjaki Records. ‘Only Yabba’ features 11 songs, including ‘Baby Sugar,’ a re-make of his own cut ‘Devil Woman,’ and ‘Good Reggae Music,’ among more. ‘Good Reggae Music’ is also an Extended Play single CD featuring four tracks that was released in 2000 on Yabba Griffiths’ ‘Su-Cram Records’ label. Yabba Griffiths’ next full length album, ‘The Yabba Griffiths Story,’ was released in 2002 on Su-Cram Records label. ‘The Yabba Griffiths Story’ features 17 songs. Over the past decade, Yabba has – as always- been a busy man. The past decade has seen him focused on raising a family, writing his first autobiography, ‘The Yabba Griffiths Story,’ and touring the country non-stop in support of his early body of work. The Hollywood Sentinel did an exclusive interview with Yabba, and the following is an excerpt of those questions and answers. Hollywood Sentinel: Who are you, for people who do not know? Yabba Griffiths: I am a singer, songwighter, and consummate performer. Hollywood Sentinel: What do you consider your biggest accomplishment in life? Yabba Griffiths: Having and raising three kids. Hollywood Sentinel: That’s great. Where did you learn how to sing and play guitar and and perform? Yabba Griffiths: I learned at The Stony Hill Advocate School In the Parish of Saint Andrew, Jamaica. Hollywood Sentinel: Cool. When did you know this was your mission in life, to be a singer and performer? Yabba Griffiths: At about seven years of age. Hollywood Sentinel: Wow. Who are some of your great influences? Yabba Griffiths: Derrick Morgan, Temptations, Tom Jones, Al Green, Aretha Franklin, Ken Bothe. Hollywood Sentinel: What does the Rastafarian movement mean to you and can you briefly explain it in your words for those who do not know? Hollywood Sentinel: Great. What is your advice to other musicians struggling to make it? Yabba Griffiths: Be original, be honest, be consistent, be on time, find a game plan and stick to it. Hollywood Sentinel: That’s good advice. How do you want to be remembered? Yabba Griffiths: As a good and serious man who understands the rules Of law and order of life. Hollywood Sentinel: Cool. Please tell us anything else you want the world to know about you. Yabba Griffiths: I am a rule enforcer. Hollywood Sentinel: What do you mean by that? Yabba Griffiths: I enforce the rule in everything I do, which consists with the rules of the law and order of life. I enforce the rule of law of order and life in any and everything I do. Hollywood Sentinel: How do you do that? What do you mean? Yabba Griffiths: If you are not a rule enforcer, people will walk all over you and take advantage of everything. For example, if someone is working with me, and someone cuts them down to me, I will stand up for them. I stand up for my friends and neighbors. I stand up for what is right for my friend and community and people. Some people walk away when they hear or see something they don’t agree with. if I don’t agree, I stand up and say something. If you are a person who does not enforce the rule and order of life, you are living for yourself alone. If you live life for others, then you are following the rules of Christ- the great man that walked the Earth, and that means doing the right thing and standing up for what is right. That’s what I mean when I say I am the rule enforcer. I enforce the rules of life, I stand up for what is right, I do my very best to do the right thing. Hollywood Sentinel: That makes sense. That’s cool, I like that, I can agree with that. Yabba Griffiths: Yes, when you learn how to live, choices are easy to make in life when choices are to be made. And when you have obstacles, you have all of your mistakes that you made in the past to look back on and learn from! Hollywood Sentinel: That’s true! It was good talking with you Yabba, and we look forward to talking again. Thank you. 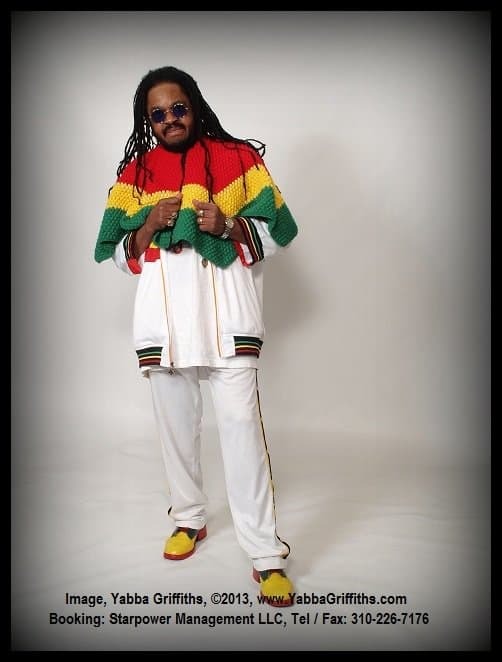 To book Yabba Griffiths, contact Starpower Management LLC at 310-226-7176.